« BibleNewsProphecy: Is there a coming King of the South? MADRID — European Commission President Jean-Claude Juncker calls Catalonia’s secessionist push a “disaster” and has reaffirmed Europe’s support of a unified Spain. Pope Francis wants Europe to employ “creativity” with issues in Europe. That, in my view, is consistent with the type of reorganization that the Bible says will happen in Europe (cf. Revelation 17:12-13). There are problems within the European Union. Places, like Catalonia want to be independent of their nation (in the case of Catalonia, it declared independence from Spain–but Spanish King Felipe VI and the Spanish invoking of its constitutional article 155 oppose this). The European Union is concerned that these types of separations would render the EU ungovernable. Some have suggested regions to replace national governments in Europe. Does the Bible teach that Europe will have problems being united? Do the ten kings in Revelation 17:12 gain power in some type of reorganization that will not simply be across existing national boundaries? Will there be more civil unrest in Europe? Will a leader arise in Europe promising peace? Will he gain power? Does any of this have to do with the warring Beast of the Sea of Revelation 13 and the King of the North of Daniel 11? What does the Bible teach will happen to Europe? Dr. Thiel addresses these issues and more. Here is a link to our video: Ten Kings, Catalonia, and the Future of Europe. The Vatican has long pushed European unity. Catalonia will be part of that. When he received the International Charlemagne award for promoting European unity on May 6, 2016, Pope Francis stated that he dreamed of a humanistic European utopia. He mentioned that his church is needed to bring about Europe’s potential. Is Europe possibly going to unite into a type of United States of Europe? Is it possibly going to bring about a real utopia? What does the Book of Daniel teach about the current divisions in Europe? What does any of this have to do with the Bible, prophecy, or Babylon? Here is a link to our video: Pope Francis dreams of a Babylonian utopia. As mentioned earlier, Pope Francis called for “creativity” to resolve various European matters. There are various issues in various parts of Europe, beyond Brexit and Catalonia. PARIS — In the 13th straight weekend of “Yellow Vest” demonstrations in France, protesters showed no sign of letting up pressure on the government and did not appear appeased by concessions by President Emmanuel Macron. Motorcycles and trash cans burned as throngs moved in a wave through Paris, and protesters set fire to a car in front of the Eiffel Tower belonging to an antiterrorism unit. One of France’s foremost public intellectuals has posted a 4,000-word screed exposing collusion between “the brute” Emmanuel Macron and the mainstream media to put down the Gilets Jaunes, all while blaming them for the violence. “Emmanuel Macron has chosen not to maintain order, but to suppress public protest,” writes Michel Onfray in his blog, in an attempt at a definitive account of the protests that have gripped France since November. The Bible warns that nearly all on the earth in the final end times will be deceived by what will come out of Europe (2 Thessalonian 2:9-12) and fall for it (Revelation 13:8). Have the ‘love of the truth’ so that you will not fall for this as more and more are coming to believe that human protests or global human government is the key to peace. The Bible says that Jesus is the ‘Prince of Peace’ (Isaiah 9:6) and it will take the return of Jesus Christ and the establishment of the millennial kingdom of God to bring peace–not the false political movements. This entry was posted on Sunday, February 10th, 2019 at 8:30 am	and is filed under Prophecy. 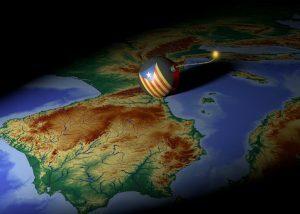 Catalonians vote for independence parties: What will happen?